In France they serve roast chicken with this unbelievable brown sauce. It’s one of the great roast chicken recipes. French roast chicken is up there with Zuni Cafe roast chicken with bread salad and Marcella’s chicken with lemons. I tried to recreate it at home for years. I had pretty much given up. Then I tried the French roast chicken from Anthony Bourdain’s Les Halles cookbook (he was a chef before he became, well, before he became Anthony Bourdain). Wasn’t even looking for the brown sauce and there it was. Revelation. Rich, complex, delicious. Lemon, onion, rosemary, white wine – all there and beautifully balanced. If you are looking for a signature roast chicken this one is a good candidate. I’ve modified the recipe a bit but credit still goes to Les Halles. If you’ve made the super concentrated chicken stock – this is a good place to use some. A truly wonderful roast chicken is a marvellous thing. 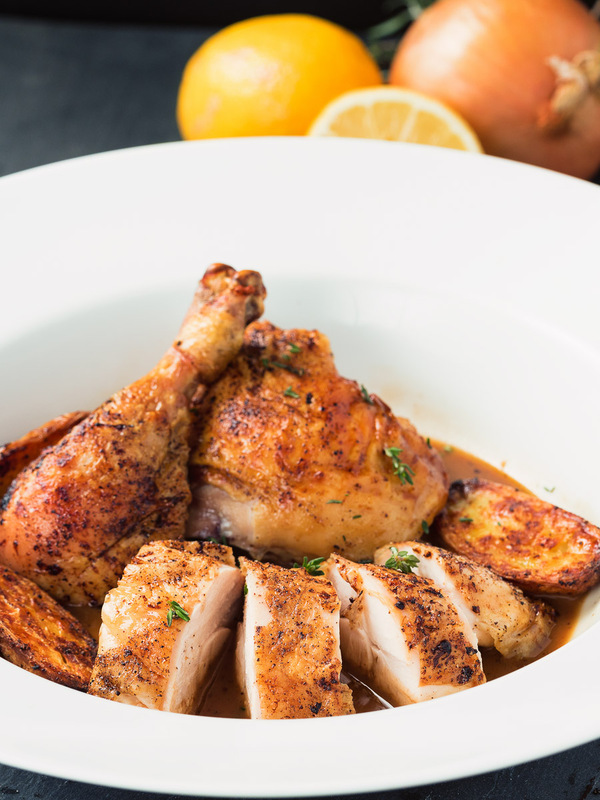 This roast chicken with lemon is sure to impress. Pre-heat the oven to 385F. Put your roasting pan into the oven. Order is important. Put the thyme and rosemary into the cavity, followed by the 1/2 lemon and finally the 1/2 onion. Tie the legs together with butcher's twine (look closely in the picture). Rub the chicken with olive oil and then season generously with salt and pepper. Place the chicken in the hot pan - it should sizzle - and put it in the oven for 5 minutes. This will prevent the bird from sticking. Remove the pan from the oven and pour 1/2 cup white wine around the chicken. It should sizzle again. Return to oven and roast until you hit an internal temperature of 165F in the breast, 175F in the thigh - 45 to 55 minutes. Baste the bird at around the 25 minute mark - just spoon some fat out of the pan and over the bird. When you hit temp, pull the chicken from the oven and then transfer it to a cutting board. Spoon off all but about 1-2 Tbsp of fat from the pan, taking care only to remove clear fat. Anything liquid with colour is flavour. You want that. You also want all those wonderful brown bits in the bottom of the pan. That's called fond and it's about the best thing you can put into a sauce. Heat the pan over medium heat. When it starts to sizzle, add the remaining 1/2 cup of wine. Boil it down, scraping constantly to dissolve the fond, until it's a wonderful sticky glaze. Add the chicken stock and concentrated chicken stock (this puts it over the top) and reduce by about half. 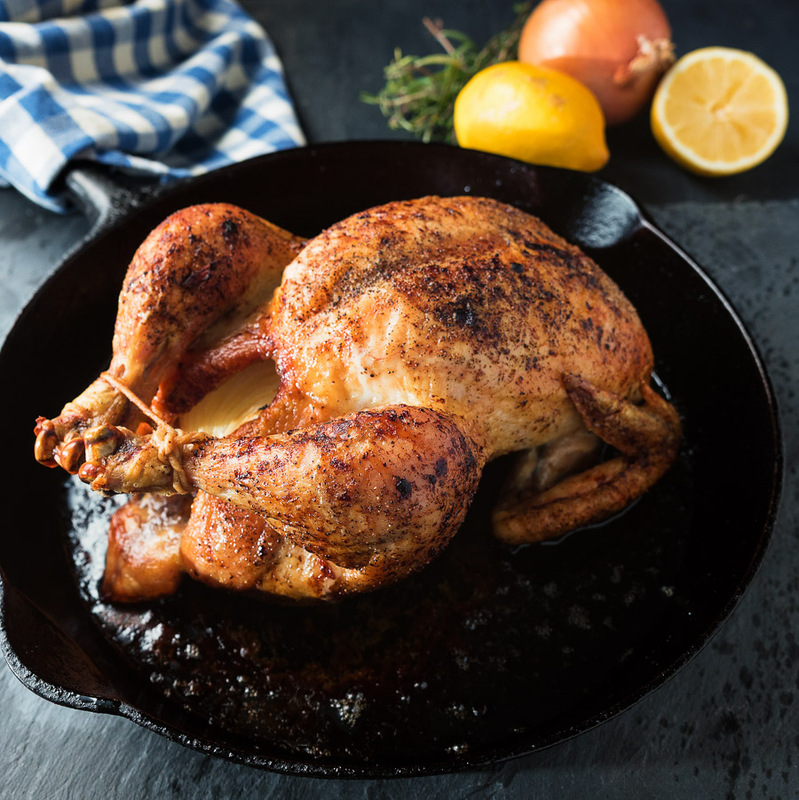 Once the chicken has rested around 15 minutes carve into quarters (whole legs plus a boneless chicken breast picking up the wing). If this doesn't make sense, google "chicken supreme" images. Same thing except keep the whole wing. Pour any accumulated juices back into your sauce (more flavour), re-heat the sauce if necessary and serve. An oven proof skillet that just fits the chicken works well for this recipe. When you pull the chicken out of the oven put a cloth on the handle of the pan to remind you it's been in an oven for an hour. If you don't, you will grab it and burn yourself. Everybody does it once - let's not make this "that time". It really, really hurts. In french, main course, poultry. Bookmark the permalink. I am so happy to have found this recipe. I regularly cook roast chicken with various styles of gravy but have never been able to reproduce the ‘jus’ that you can get with your rotisserie chicken In France. The recipe seemed very straightforward here and not hugely different from some other variations I have done but somehow suddenly that magical and distinctive jus appeared – I am impressed and very grateful! Haha. That’s exactly how it happened for me too. Magically it just appeared – after I had been looking for it for 10 years.